This photo is what Van Cleef & Arpels deemed appropriate for their remodel on the corner Rodeo Drvie and Dayton Drive in Beverly Hills. Unlike Bulgari, Van Cleef Arpels' jewelry is classic in its luxury appeal. It is an old world French jewelry company, founded in 1906 on the venerable Place Vendome in Paris. The brand is known for its signature mystery settings where the prongs are concealed. Van Cleef & Arpels' customers have included the Duchess of Windsor, Grace Kelly and Elizabeth Taylor. Their remodel facade is subtle and understated like their mystery settings. 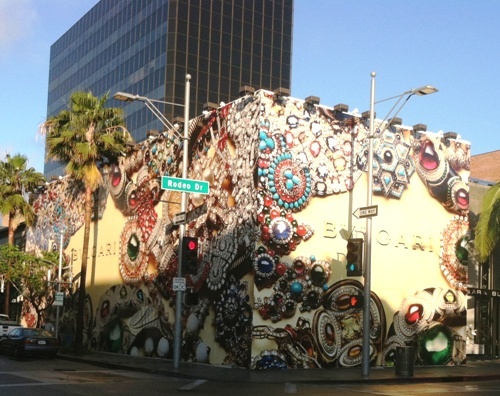 Last month we wrote a post illustrating how remodeling is creatively camouflaged in Beverly Hills. We featured the Bulgari jewelry store who, in keeping with their brand identity, had designed a bright golden opulent camouflage while remodeling their store. True to their identity, the store board was colorful and attention getting. We feel it is spot on its brand signal. It is perfect for who they are. Every company has its point of attraction for their target market. It is clear how two brands selling jewelry have a different approach because they understand their ideal client. We happen to like and appreciate both because of their clarity in communicating who they are. What do you think?